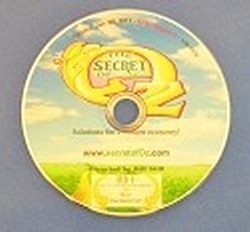 The Secret of Oz DVD - FREE with $250 or more orders. The Secret of Oz DVD - (2009) IMDB Rating of 8.4. We have all watched the movie The Wizard of Oz dozens or hundreds of times, but ever wondered what it was all really about? Who is the Wizard? The cowardly lion? The tin man? Dorothy? This documentary lays down a very convincing argument for the meaning behind the movie. Note: This movie presents a well thought out explanation for the symbolism in the movie The Wizard of Oz. While the opening of the can is fascinating, we make no judgement right or wrong on the underlying message. We present it here because it's a fascinating story, and it's one we believe people should be talking about it.